ANNAPOLIS, MD (October 01, 2016) – Lionfish have a lot going for them. They are a spectacular little fish, highly variable in coloration and carrying a halo of ornate fin spines that appear both delicate and menacing. Their spines can deliver a powerful toxic assault on a would-be predator or a careless swimmer. Like sting rays, lionfish are loaded with a cocktail of venoms to cause maximum pain. Few predators are interested in that experience, although some predatory fish are learning how to enjoy this unfamiliar newcomer. Lionfish are voracious predators of smaller fish and can cause enormous imbalances in fish populations by feeding on young native fishes. Maryland Invasive Species Council has chosen lionfish as its October Invader of the Month. Since their introduction into the waters of South Florida in the 1980's (almost certainly as a pet release), lionfish have munched their way through the Caribbean. Coastal currents have brought an armada of individuals up the Atlantic coast as far as Massachusetts, although this warm water species is incapable of withstanding winter weather. All of the most popular scuba diving spots in the Caribbean are now seeing lionfish on a regular basis and many divers and dive boat operators are fighting back. Dive masters and guides regularly spear any lionfish they see. In Florida, an innovative new non-profit organization, the Reef Environmental Education Foundation (REEF) is running "Lionfish Derbies" in which hundreds of lionfish are culled. A commercial robotics company recently unveiled an experimental lionfish roving vacuum cleaner. And fortunately lionfish, while tricky to handle, make non-toxic and quite tasty table fare. 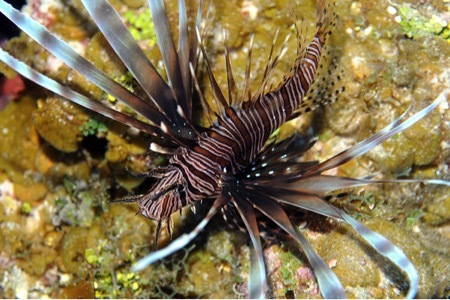 These efforts can be successful in keeping popular dive spots relatively lionfish-free. But popular dive spots are a small fraction of the Caribbean coral reef ecosystem. Popular scuba locations that are regularly weeded of lionfish will become increasingly important refuges for reef fish that would otherwise be overwhelmed by lionfish predation, but they will be increasingly rare and isolated as the larger reef ecosystem is overcome. The lionfish joins a number of ocean invaders that are expanding in the western Atlantic. The Australian spotted jellyfish is adapting to life in the Gulf of Mexico. The green crab has been established in the northern Atlantic coast of the United States since the 1800's, becoming ubiquitous in tidal zones in New England and the Canadian Maritimes. Many other exotic fishes common in the pet trade have been found in Atlantic waters but have failed (so far) to take hold. While it's hard to imagine a scenario in which the lionfish becomes an important invasive species in Maryland waters, it will be interesting to watch its progress in the coming decades as coastal waters warm and rise. Current habitat modeling suggests that Maryland waters may already be within the seasonal range of lionfish. While lionfish are thought of as a reef fish, they inhabit many other marine and estuarine habitats. Ironically the more successful we are in cleaning up the Chesapeake Bay, the greater the chance that we will see more lionfish. Whether we like it or not, the invasive lionfish will be a real-life barometer of human effects upon our oceans, through the international pet trade, overexploitation of the oceans, and the rapid release of fossil carbon into a warming environment.